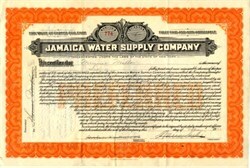 Beautifully engraved certificate from the Jamaica Water Supply Company issued in 1925. This historic document was printed by Security Bank Note Company and has an ornate border around it. This item is hand signed by the Company's President (Warren Leslie) and Secretary (Ruben Kirkwood) and is over 80 years old. The Jamaica Water Supply Company served over 118,000 households in Queens, N.Y. until it was acquired by New York City.